Faraday is remembered best for his experiments with electricity and magnetism. 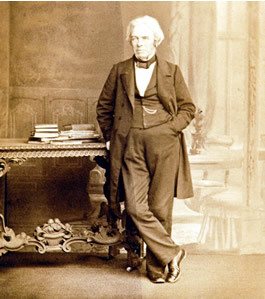 Michael Faraday had very little education and was apprenticed to a bookbinder, but after he heard the scientist Sir Humphrey Davy speaking he wrote to him and got a job as Sir Humphrey's laboratory assistant. In 1820, Hans Christian Oersted and Andre Marie Ampere discovered that an electric current produces a magnetic field. Faraday thought that this probably meant that a magnetic field could be used to reverse the process and produce an electric current. The principle of induction which he thus discovered led to the invention of the dynamo or generator, which creates electricity. Faraday also developed the theory that electricity has fields. The Town Library has a copy of his classic book which was based on a series of six lectures which he gave to children, published in 1860 as The Chemical History of a Candle.